Thomas Hayward / Haywood was born in Yeovil around 1835 the son of glover John Hayward and his wife, Maria. 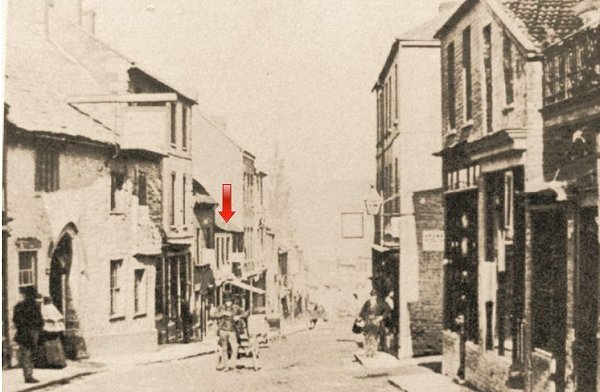 In the 1841 census Thomas was living in Back Street (today's South Street) with his parents and five siblings. By 1851 the family were living in Willmington Lane (possibly an early name for Salthouse Lane) and Thomas, now aged 15, gave his occupation as tailor. By this time he had eight siblings. In the 1861 census Thomas and his new wife, Sarah Ann (b1841, Charminster, Dorset), were living in Middle Street and he described his occupation as a tailor and beerhouse keeper. Thomas and Sarah were to have three children It seems likely that Sarah ran the beerhouse during the day and Thomas, after spending the day at his 'normal' job, took over during the evenings which was a very common practice in beerhouses. It is thought that Thomas' beerhouse had earlier been known as the Skinner's Arms. 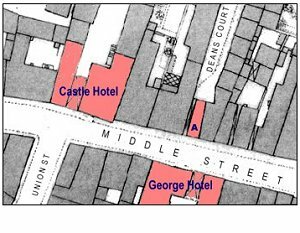 In 1853 the licensee, one Thomas Fooks, had lost his license and been heavily fined for serving beer "during Divine Service" and allowing spirits (fetched from the George Inn across the road) to be consumed on the premises. A beerhouse license did not allow the sale of spirits or fortified wines, and any infringement would result in the beerhouse being closed down and the owner heavily fined. Beerhouses were not permitted to open on Sundays. The Post Office Directory of 1866 recorded that Thomas Hayward was a 'Shopkeeper of Middle Street' but no further detail is given. Sarah was living in Middle Street in the 1871 census and described her occupation as greengrocer. Thomas was conspicuous by his absence (as he was for the following census in 1881), but there were five lodgers. Whether or not the greengrocery had a beer barrel sat on a table in one corner can only be guessed at.